Ivan Solomon demonstrates the sturdy nature of his bookcase. It’s no surprise that education leads the list of actionable attributes that comprise the Tulalip TERO vision statement. The savvy folks at TERO know that education, ranging from early learning to meaningful vocational training, can lead to greater opportunities for Tribal members of all ages. 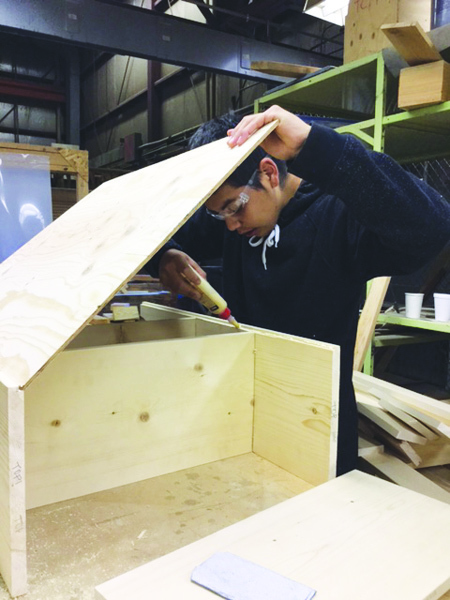 Under the TERO umbrella, the construction training program continues to thrive thanks to the generous and consistent support of the Charity Table administered through the Tulalip Foundation and ongoing funding through the Washington State Department of Transportation. Recent infrastructure changes include a dynamic $500,000 grant (over three years) from the W.K. Kellogg Foundation and a new affiliation with Renton Technical and South Seattle Community Colleges. TERO dollars, a Tri-County WorkSource grant and other grants also support enhanced learning and help provide diverse and stable funding sources for the program. Both Gobin and TERO Client Services Coordinator Lynne Bansemer are quick to point to partnerships and strategic alliances with others as a major reason for the continued success of the program. Along with building personal relationships with the trades and labor unions they also praise the work of Susan Crane with SkillUp Foundation for her efforts to help secure the W.K. Kellogg Foundation and other supporting grants. While the financial impact of the substantial Kellogg grant may seem obvious, the requirements for funding also serve to enhance the program and are closely aligned with the deployment of additional resources. Along with improved tracking of students after training, the grant will help fund a new family and career navigator and allow for broader exposure to trades and apprenticeship opportunities. 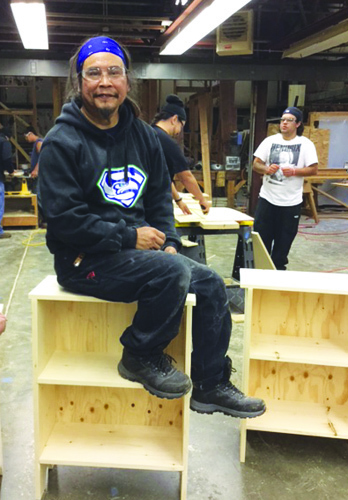 To help meet the Kellogg grant goal of multi-generational impact, the students constructed small bookcases which served as the inspiration for a collaborative activity during a family open house held Nov. 6. On Saturday, family members visited the classroom to share in the completion of the project by helping to paint and decorate the bookcases before taking them home. Site Specialist Billy Burchett credits the staff at TERO for their work to help strengthen the program. He feels that taking a more “college-like” approach, beginning with the application and registration process, has resulted in a stronger commitment and higher level of engagement from the students. While the ultimate goal is steady employment with a living wage, each student arrives at this moment from a different perspective. Ivan Solomon is seeking a better life for his family. Helping to raise his niece and nephew, Solomon is confident that the knowledge he’s gaining will lead to steady hours and a consistent income. He’s really enjoying the chance to leave the classroom for field trips and understands that the chance to learn additional employability skills like CPR, forklift operation and flagging are helping him with his goal to “take his life back”. Dante Jones glues a back piece to his bookcase project. Although he admits that his presence in class is the direct result of an insistent mother, Dante Jones is confident he’ll be able to walk out of this class and earn a starting wage of $20 an hour working as an apprentice in a variety of trades. Yet, he believes his earning potential is much higher, “I’m looking further than a $20 per hour job, and I know I can do it!” Jones confidently asserts. Applications for winter quarter with classes starting February 1 are available through the TERO office. Contact Lynne Bansemer at 360-716-4746 for further information. This entry was posted in Local News, Tulalip News and tagged TERO, Tulalip Tribes by Kim Kalliber. Bookmark the permalink.